Union members and state leaders spoke at a March 28 news conference about the one-year extension of DED for Liberian immigrants and the need for a long term solution and path to citizenship for these workers. Unions represented included SEIU Healthcare Minnesota, Building Trades unions, AFSCME Council 5, Amalgamated Transit Union Local 1005, Minnesota Nurses Association, United Food and Commercial Workers Local 663, and UNITE HERE Local 17. 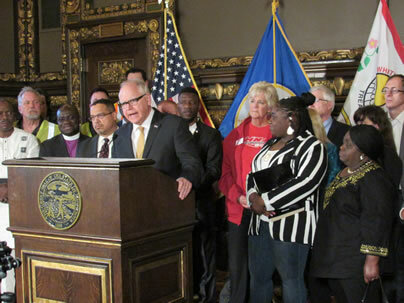 SAINT PAUL —Good news for Liberian immigrant workers and their families was celebrated at a Minnesota State Capitol news conference this afternoon, a news conference previously scheduled to urge an extension of a March 31 deadline that would have terminated permission for thousands of Liberians to live and work in the United States. Just a few hours earlier, President Donald Trump announced he would extend the Deferred Enforced Departure program for Liberians for one year. 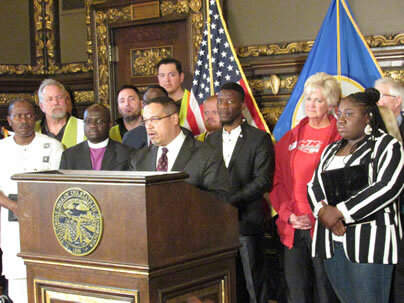 Labor representatives gathered after the news conference with Minnesota Attorney General Keith Ellison. 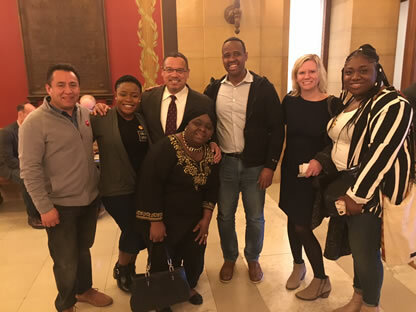 Left to right: Uriel Perez Espinoza, UNITE HERE Local 17; Alfreda Daniels, Minneapolis Regional Labor Federation; Minnesota Attorney General Keith Ellison; Isabella Wreh-Fotana, SEIU Healthcare Minnesota; Abdul Omar, AFSCME Council 5; Chelsie Glaubitz Gabiou, Minneapolis Regional Labor Federation; Abena Abraham, SEIU Healthcare Minnesota.